If you’re like me you would have to look across the landscape of America and confess that the level of hate in our nation unfortunately appears to be on the increase. We continue to be deeply saddened at the exposed racial hate that so many demonstrate towards one another. We feel the hurt and pain associated with the deep and bitter hatred some people have expressed toward Jesus Christ and those who follow Him as disciples, the seemingly out of control hate that is expressed through revenge on those that have been identified as the enemy, while all the while lifting hate mongers to positions of authority and veneration. When the heart is filled with hate it often leads to that which the Scripture clearly forbids...murder. Whenever murder takes place it is something that comes out of the heart...it is not placed into the heart. The book of Exodus records for us that you shall not murder. It doesn’t prohibit the pursuit of a just and righteous war when necessary to protect the innocent and to stop evil. It doesn’t prohibit the killing of animals...for in the same context we read the instruction that the Lord gives for the sacrificing of animals. We know Jesus ate fish. It also isn’t a prohibition against capital punishment for in the same context the Scripture records the responsibility of the government to protect the innocent from the criminal. The Bible does make a distinction between killing and murder. Murder is intentionally taking the life of another person driven by the hate or by the greed or by the lust in the heart. We easily recognize this type of murder that is occurring far too often in our society and across the world. The hate and the anger in our nation are beginning to explode and we see it every night on the news. But there is another kind of murder that sometimes flies right under the radar and it’s not so easily recognized and yet it is just as wrong. And perhaps you and I have participated. I know that at the very least we’re guilty of murdering Christ on the cross because of our sins. But what about stopping for a moment to consider that whole anger thing that we often engage in? Look, there are some things we should hate in life...the same things the Lord hates...whether it is lying or any other sin that destroys the lives of people and leads to broken hearts and eternal separation from the Lord God. But we are not to hate people or have anger in our hearts towards them because the results are devastating in their lives, our lives, and results in the very tearing of the fabric of our society. Protect the innocent, protect property, stop destruction, stop injustice, and stop the unnecessary rousting...yes! But not with a heart of anger or hate. What the Lord saying in Matthew 5...if your heart is an evil heart that is consumed with anger toward other human beings, made in the image of God, and you have contempt, or speak with contempt toward another human, regardless of their color, the Lord writes down in heaven, murder! You and I may never be tried in a human court but the Lord sees and the Lord knows what’s in your hearts and mine...and it’s wrong. The problems in our society today that are brought on by hate, seen or unseen and hidden away, both coming out of the heart of hate will never be solved by the government. They will only be solved by you and by me when we start allowing the love of the Lord Jesus to fill our hearts and flow out of us towards all. It is our only hope. That’s who Jesus is...the Savior...the one who can forgive sin and change a heart and bring reconciliation and restoration to the heart and the land. We can be a part of the problem or work on being a part of the solution and it starts with asking the Lord to take the anger and hate out of our own hearts. You and I can do something to help our nation. Rid the heart of hate and anger. In Chuck Colson’s book Life Sentence he records a dinner meeting between himself and two new Christians as well as some other men and their wives. Billy Graham had called earlier and asked him if he could begin working with a new Christian, Eldridge Cleaver. Imagine the setting, here you have one Tommy Tarrants, formerly a leader of the most violent segment of the Ku Klux Klan and Eldrige Cleaver, one time leader militant of the Black Panthers. During the dinner those who had gathered shared their experiences with Christ. Colson, fearing that Cleavers wife, who at the time had described herself as a non-believing Jewess, was not eating because she was offended by the spiritual conversations taking place, he walked around to her side and said something to the effect that “you must think we’re all a little crazy?” She replied, “well, if you’re crazy, then the whole world needs to get crazy!” They enjoyed a sweet time of fellowship, the hate and anger was gone...replaced by the life changing love of Jesus Christ. It’s happened before...and it can happen again. Let’s get honest and let it start with us. Let’s get crazy! 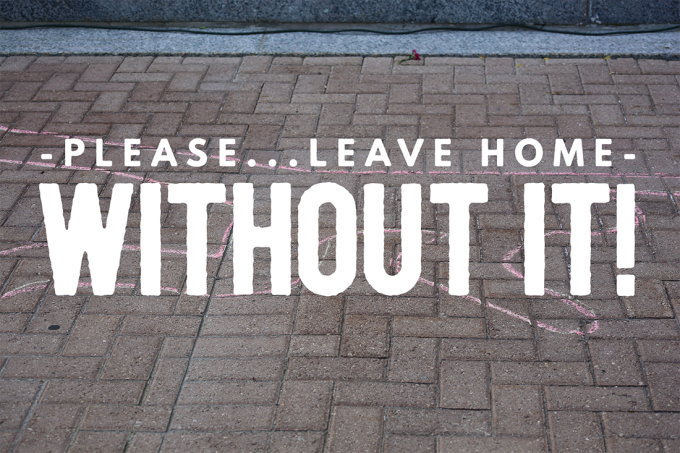 With no hate in the heart or in the home we can be sure that we have done what we should...Left home without it!